Born in Bristol, England; Long studied at the University of the West of England’s College of Art during the years of 1962-5, then to St Martin’s School of Art and Design, London during 1966-68. 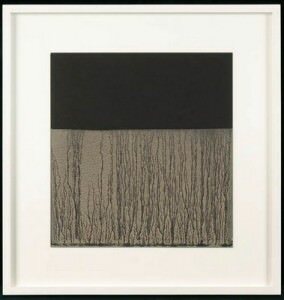 Within a year after he graduated from St Martin’s, the artist became closely associated with the emergence of Land Art; he also participated in the first international manifestations of both Arte Povera, in Amalfi, Italy in 1968, and Earth Art, at Cornell University, New York in 1969. Art WorkLong made his international reputation during the 1970s with sculptures made as the result of epic walks, these take him through rural and remote areas in Britain, or as far afield as the plains of Canada, Mongolia and Bolivia. He walks at different times for different reasons. At times, these are predetermined courses and concepts; yet equally, the idea of the walk may assert itself in an arbitrary circumstance. Guided by a great respect for nature and by the formal structure of basic shapes, Long never makes significant alterations to the landscapes he passes through. Instead he marks the ground or adjusts the natural features of a place by up-ending stones for example, or making simple traces. He usually works in the landscape but sometimes uses natural materials in the gallery. Different modes of presentation, sometimes combined, were used to bring his experience of nature back into the museum or gallery. From 1981 he also alluded to the terms of painting by applying mud in a very liquid state by hand to a wall in similar configurations, establishing a dialogue between the primal gesture of the hand-print and the formal elegance of its display. He stressed that the meaning of his work lay in the visibility of his actions rather than in the representation of a particular landscape. 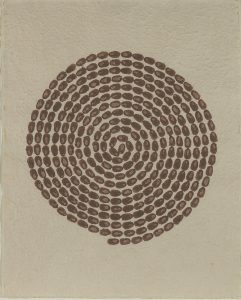 Nearly forty years on, his work continues the dialectic between working freely and ephemerally wherever in the wide world, and bringing it back into the public domain of art spaces and books in the form of sculptures of raw materials such as stones, mud and water and photographic and text works. A Line Made by Walking (1967)Richard Long, then eighteen years old and a student at Saint Martin’s School of Art in London, walked back and forth along a straight line in the grass in the English countryside, leaving a track that he then photographed in black and white. The work, taken as the milestone in contemporary art, balances on the fine line between the performance (action) and the sculpture (object). ‘I think circles have belonged in some way or other to all people at all times. They are universal and timeless, like the image of a human hand. 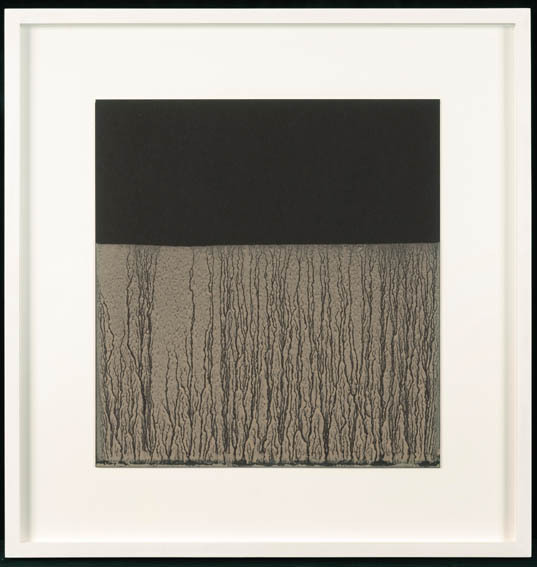 For me, that is part of their emotional power, although there is nothing symbolic or mystical in my work.’ – Richard Long. Stone, Driftwood and MudLong works with indigenous materials, such as stone, wood and mud, collected from his numerous walks around the world. Stone is one of the earliest material used by man to fashion tools; and one of his preferred materials. Delabole Slate Circle, a solid circle made on the floor with slate from the Delabole quarry in Cornwall, was constructed by slate roughly cut to retain as much of its natural character as possible. The circular arrangement is an imposed order, but the flatness of each piece is characteristic of slate, representing a natural order. River Avon Driftwood (1976) seemed to hold chance and order in equal sway, as in much of Long’s work. It is made up of bits of driftwood which he gathered from the banks of the River Avon below Leigh Woods, near the Clifton Suspension Bridge, Bristol. These are used randomly, and spaced approximately but within the precise form of an anti-clockwise spiral. Objects which arrived at a given point by chance, through the flow of the river, are organized into a logical, and ancient, pattern. From 1981 he also alluded to the terms of painting by applying mud in a very liquid state by hand to a wall in similar configurations. Mud has represented the ground he stepped through his walks and the realization of these “murals” establishes a dialogue between the primal gesture of the hand-print and the formal elegance of its display. He stressed that the meaning of his work lay in the visibility of his actions rather than in the representation of a particular landscape. MacDuff Circle (2002), by Richard Long in the grounds of the Dean Gallery, Edinburgh (National Galleries of Scotland).Long usually works in the landscape but sometimes uses natural materials in the gallery. The scale of his sculptures is determined by his response to each particular place or landscape locality. ‘I like the fact that every stone is different, one from another, in the same way all fingerprints, or snowflakes (or places) are unique, so no two circles can be alike. In the landscape works, the stones are of the place and remain there. With an indoor sculpture there is a different working rationale. The work is usually first made to fit its first venue in terms of scale, but it is not site-specific; the work is autonomous in that it can be re-made in another space and place. When this happens, there is a specific written procedure to follow. The selection of the stones is usually random; also individual stones will be in different places within the work each time. Nevertheless, it is the ‘same’ work whenever it is re-made.’ – Richard Long. At Houghton Hall in Norfolk, the Marquess of Cholmondeley commissioned a folly to the east of the house. Long’s land art consists of a circle of Cornish slate at the end of a path mown through the grass. A permanent installation is on view in the main lobby of Hearst Tower (New York City) entitled Riverlines. Completed during the summer of 2006 and the biggest wall work he had ever made – about 35 x 50 feet (11 x 15 meters).